Central Michigan University (CMU) is putting its stamp on the world of research in higher education. From studying effects of stress and aging on egg cells to finding cures for diseases and disorders, CMU’s resources and facilities are attracting bright minds in both students and faculty alike, and the work coming out of the university proves it. In the United States only about ten percent of higher education institutions receive the two highest rankings for research activity under the Carnegie Classification system. Since many of those are in larger cities and house their own major medical centers, many people get the impression that cutting edge research is only happening in big cities and at large campus hospitals, but dedication to research at CMU has given leading researchers an opportunity to do the work they're passionate about in a small town setting. Benjamin Swarts, Ph.D., Department of Chemistry and Biochemistry at Central Michigan University. Dr. Benjamin Swarts, an associate professor for the Department of Chemistry & Biochemistry at CMU, is one of those bright minds. 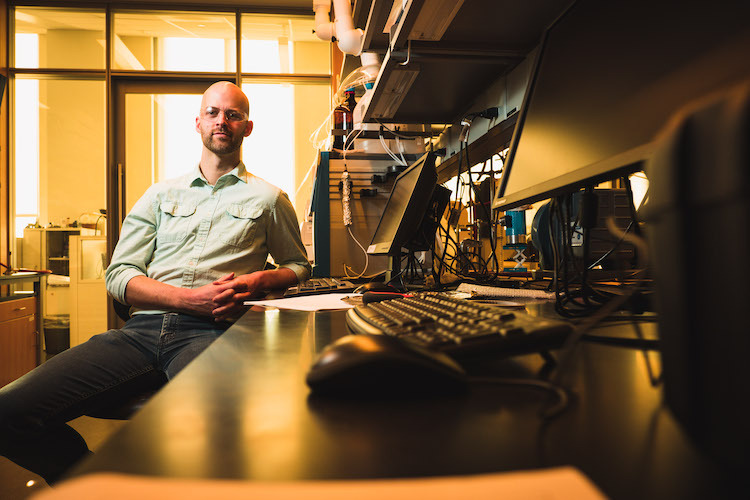 Swarts and his team are using a novel approach to study Tuberculosis: synthetic chemistry. Tuberculosis (TB) still resides among the World Health Association’s (WHO) list of the top 10 causes of death worldwide. According to the WHO, in 2017 10 million people were infected with TB, and 1.6 million of them died from the disease. TB is caused by a bacterium called Mycobacterium tuberculosis, which typically affects the lungs, but can travel to other parts of the body through the blood. TB is spread from person to person when someone with an active TB infection disperses the bacteria into the air by coughing, sneezing, or speaking. Those in the vicinity can breathe in the bacteria and become infected. Not everyone infected with TB will show symptoms. Some while infected, may have what's called latent TB. They are not ill, exhibit no symptoms, and are unable to transmit the disease, though it can become symptomatic later in life. Swarts and his team are focusing their efforts on the outer membrane of the bacterial cell envelope, the layer which protects the bacterium during an infection. With better understanding of this membrane, such as its function and composition, Swarts hopes new strategies can be designed to improve TB detection or create treatment options that target the membrane itself. Swarts says most forms of TB are treatable now, but that patients often do not complete their treatment, giving the bacterium the opportunity to mutate and return in a drug-resistant form. That's because while treatable, TB is persistent and the course of treatment needed can be daunting. Treatment for a typical non-TB bacterial infection is usually one antibiotic, taken over the course of a few weeks at most. The standard treatment for TB, on the other hand, is usually three or four drugs to be taken in conjunction over a period of six months or longer. Finding a way through the cell membrane might help doctors treat patients more efficiently. It was the opportunity to do research like this that attracted Swarts to CMU in the first place. Joining CMU in 2013, Swarts said he knew he wanted to work with undergraduate students in a research setting. Zhao’s research focuses on mitochondrial DNA and the link to many diseases, cancers, and disorders when the DNA fails or is damaged. According to the United Mitochondrial Disease Foundation (UMDF), mitochondria, commonly referred to as the powerhouse of the cell, are responsible for creating ninety percent of the energy needed for the human body to function. When mitochondria fail, various parts of the body are affected, but those requiring the most energy such as the heart or brain, are impacted most. According to Zhao, there are about 200 known mitochondrial disorders. Zhao and his team’s study focuses on analyzing how a small portion of mitochondrial DNA -- about one percent, called encoded DNA, are damaged and subsequently repaired. Mitochondrial disease is difficult to diagnose because it affects individuals differently and can present through a wide variety of symptoms such as seizures, liver failure, or hearing loss. Zhao said the average person with a mitochondrial disorder may see eight or more physicians before receiving an accurate diagnosis. “There’s such a wide spectrum of phenotypes and disorders that people could easily misdiagnose mitochondrial disease as something else,” Zhao said. The UDMF advises that when symptoms involve three or more organ systems, mitochondrial disease may be the reason. Kevin Park, Ph.D., Assistant Professor of Psychology Neuroscience Program, works in the lab at Central Michigan University. 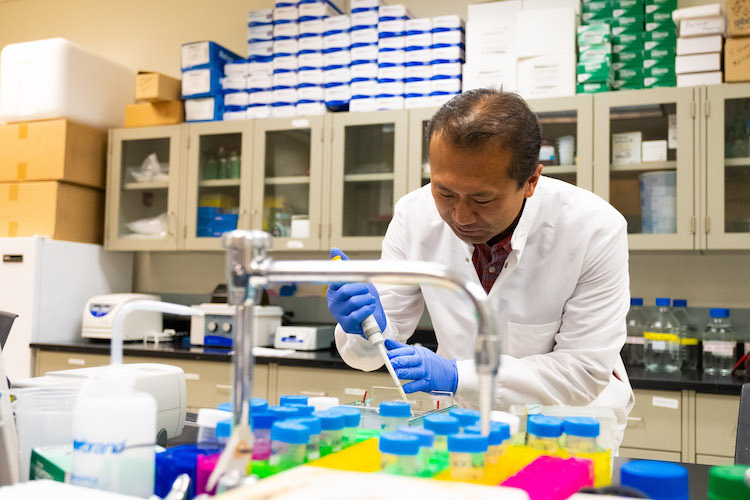 Dr. Kevin Park, psychology department faculty member and part of the neuroscience program at CMU, is yet another researcher currently working on cellular level dysfunction and repair. Park is studying Alzheimer’s, a progressive type of dementia that impacts memory and behavior. The National Institute on Aging (NIA) describes neurons as specialized cells that are responsible for transmitting information throughout the human body. Alzheimer’s disease disrupts neuron communication, causing them to stop functioning and lose connection with other neurons. Without the ability to repair themselves the neurons ultimately die. This will manifest first in a person’s memory, then later affects areas tasked with reasoning or social behavior deteriorating until eventually the disease leads to the individual’s death. As the disease progresses, two main proteins involved with the disease will cluster. Beta-amyloid form plaques between neurons and tau molecules form tangles inside neurons and block the system neurons use for communication. Park and his team are using a mouse model study of Park's own design to gain better understanding of the disease. The mice have been engineered to generate the plaques and tangles with their own proteins to imitate the gene mutation caused by Alzheimer’s disease.